Students across Canada have been more vocal to combat stigma and universities are being held to a higher standard when it comes to mental-health services. As Canadian universities and colleges face increasing pressure to provide better mental-health services on campus, students are looking to give schools fresh ideas on how to tackle the issue. That's how 24-year-old Ryan Golt became involved with working alongside Montreal's McGill University to support students. But before he got there, he faced his own mental-health crisis. After his first year of undergraduate studies, Golt says he began to feel lonely, isolated and irritable. The psychology student started to have issues with his interpersonal relationships, and ultimately, he says he couldn't function. "Eventually, it just became too much and the negative emotions started to overcome me," said Golt. That was in 2014, when he experienced his first bout of depression. It's a mental illness that impacts about 14 per cent of students at McGill, and close to 20 per cent of students nation wide, according to recent data from the National College Health Assessment, a survey that presents the health data of students so schools know where to target their services. Golt spent six months after his diagnosis keeping to himself, and not sharing what had happened with anyone. After reading other students' posts on social media groups about their own challenges with mental illness, something switched in him, he said. "For the first time, I felt like I wasn't alone, like I was a part of a community," he said. Sharing his personal story online led him to a community of young people who were talking about mental health, and supporting each other through recovery for mental illness. 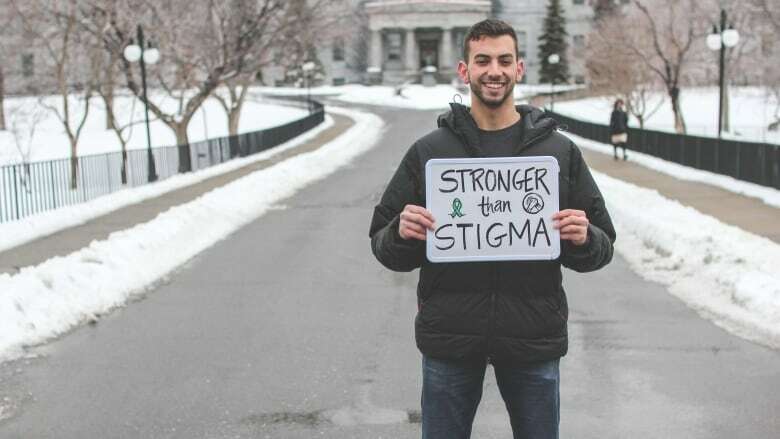 Golt said the social aspect of his healing process inspired him to create several mental-health initiatives on the McGill campus, including his own blog called WellMTL. The blog features candid personal stories by students who share their full names, with some discussing anxiety attacks, family troubles, and past issues with suicidal ideation. "The amount of passion from the students who want to support mental health is incredible, so right off the bat, the students really care," he said. Other initiatives the McGill administration introduced recently include an online therapist, which is an easier way to fit access to care into students' schedules. Golt said he's also worked on a project with the school that is still under wraps but involves finding ways to reach students who are stuck on wait lists to see counsellors, he said. Golt, who recently received a graduate degree from the school, said students across the country have been more vocal to combat stigma. "If you're not going to give us [support], then we're going to go out and do it ourselves," he said. The lack of availability of full-time jobs after graduation, increased competition and the need to acquire multiple degrees has been tough on students, he said. McCain Centre for Child, Youth and Family Mental Health. As a result, universities are being held to a higher standard when it comes to mental-health services, and they're under a microscope from incoming students, she added. "Young people see there's more opportunity to be influential in the mental-health realm," she said, adding that student-led organizations are vocal on social media, and students are connecting with each other about personal struggles with mental illness. For some students, changes can't come fast enough, with thousands of young people reporting that they are facing stress, anxiety and depression to a degree where their academic performance has suffered and getting through the day seems impossible. In 2016, about 44,000 Canadian students across 41 post-secondary schools responded to a survey that found about a fifth were dealing with immense anxiety, depression, and other mental-health illnesses, according to the National College Health Assessment. Those figures saw an increase from the previous survey in 2013. Three to four per cent more students reported they'd experienced mental illness that's impacted their performance at school. The demand for counselling services and mental-health support at many post-secondary institutions has never been greater. A survey conducted by The Toronto Star and the Ryerson School of Journalism across 15 universities and colleges last year saw that almost all the schools had increased their mental-health budget by 35 per cent. Late-night panic attacks used to plague Tina Chan, a recent graduate of the University of Waterloo, preventing her from sleeping. That experience led Chan to create a mental-health support kit that will be given to each first-year student at the school this year. 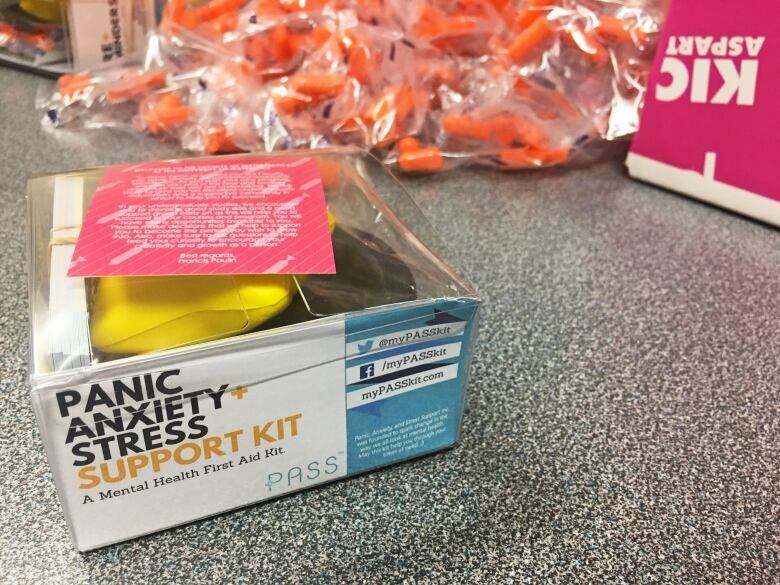 Called the PASS Kit, which stands for panic, anxiety and stress support, it contains flash cards with steps to take when experiencing anxiety, along with a squeezable stress star, ear plugs, sleeping mask, and a pack of gum. Every item is designed to bring a student down from a panic attack, said Chan. "Students were saying that it helps them start a conversation around stress," she said. The University has purchased 7,100 of her kits, to be given to first-year students this fall. "There is a lot being done in the university. We have workshops and support groups, and they are effective, especially in the peer-support sense," said Chan. "But I think the university should promote the existing tools they have ... there are small things that can be changed." "It could be just making professors' office hours at convenient locations ... just little changes in the student environment could help stress in general...to promote a culture of wellness," said Chan. In a statement, the University of Waterloo said they are increasing the number of mental-health professionals on campus along with the introduction of Chan's kits, and they are implementing recommendations from a review of their services that came earlier this year, including increasing the number of mental health professionals on campus to 70. The school also said they provided 19,500 hours of counselling services to about 4,000 students in 2016-2017 — an 11.4 per cent increase over the previous year. But the school understands there's still an issue with wait lists, said Walter Mittelstaedt, director of campus wellness. He said the school is encouraged to keep pushing for new ideas, since students are consistently voicing their opinions. "We experienced tremendous engagement," he said, adding more than 300 students came out to discuss the release of the mental-health recommendations with administration. "It's encouraged us to keep our eye on the ball with this issue." Students like Chan have been vocal in recent years when they've felt schools haven't met their expectations. The University of Toronto faced criticism from student groups about a new policy passed at the end of June that could place students with mental-health issues on mandatory academic leave. The policy stipulates that a student could be placed on leave if they pose a risk of harm to themselves or others in relation to mental illness. At the time, the school said the measures aren't meant to be punitive, and that it would only be in extreme cases if accommodations have been exhausted. "It's a compassionate approach to supporting students when they're really unwell, and it removes them from the disciplinary process," said Janine Robb, executive director of the health and wellness centre at the school. "Prior to this policy we had to use the student code of conduct. Mental health and mental illness shouldn't be a conduct issue, it's a health issue." Students claimed the policy could deter students from being open about mental illness and seeking help.